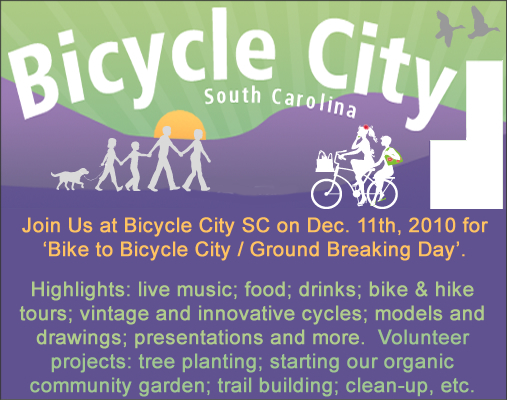 Beautiful Lexington County, SC has been chosen as the first Bicycle City location. It is in between the mountains and the beach and about 12 miles from the state capital of Columbia. Climate: Year-round hiking, cycling, kayaking. Mild avg. monthly high temperatures of 55 – 92 degrees. Design: Mixed-use, Compact, and Pedestrian-Friendly. Economy: We will encourage living and working in our local community. Education: Columbia is home to 8 major academic institutions including the Univ. of SC with about 25,000 students alone. Environmental: We can protect and encourage bio-diversity and help with regional sustainable initiatives. We will reduce driving, traffic and air pollution. Recreation: The property contains: miles of walking, hiking, and cycling trials/unpaved roads; and a lake for kayaking year-round. About 3 miles from the borders of Congaree River. Value: We plan to offer eco-friendly single and multi-family homes at many price points within a community that helps people save money on energy, transportation and other costs. Water: There is a spring fed lake for kayaking and walking around. BC will be a model community for storm water management with permeable surfaces and other low impact designs and practices. With miles of beachfront that gently ease into acres upon acres of lush rolling hills into the Blue Ridge Mountains, South Carolina is an outdoor enthusiast’s dream. Take a kayak out for a day through the state’s winding creeks and rivers and meander out to the Atlantic Ocean. Hop on a mountain bike and take to the rugged and challenging mountain trails. Take a seat near a lake and fish as the sun rises. As one of the country’s most popular vacation destinations, as well as one of the fastest-growing areas in the country, South Carolina’s temperate climate, southern hospitality and varied terrain offer tremendous potential for a prospective Bicycle City development. Other Highlights: In addition to its variety of outdoor recreation opportunities, attractions in Aiken include several wineries, the Aiken County Historical Museum and one of the country’s last remaining drive-in movie theaters. Other Highlights: In addition to Charleston’s rich southern history and charm, the metropolitan area is surrounded by a number of parks, forests, beaches and rivers, offering lots of activities for residents and visitors alike. Other Highlights: Clemson is home to Clemson University and its hugely popular athletic teams. Attractions in the area include a number of historical forts, churches and homes. Other Highlights: Home to three rivers and 35 parks, Columbia also offers residents and visitors a dynamic nightlife, plenty of shopping opportunities and classic southern hospitality. Other Highlights: Spartanburg was the first and only city in South Carolina to be named a Bicycle-Friendly Community by the League of American Bicyclists. Spartanburg has also been consistently named one of the best American cities to live. Home to a diverse topography, South Carolina is an outdoor recreationist’s dream. With mountains, rolling hills, miles of ocean coastline and plenty of thick forests in between, opportunities abound for mountain biking, hiking, kayaking, fishing and much, much more. South Carolina’s welcoming environment and friendly southern culture is an ideal fit for the first Bicycle City community.